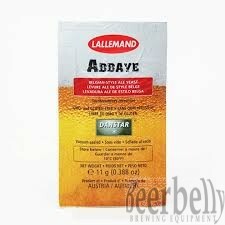 Danstar Abbaye Dried Yeast 11gm Quality Home Brewing Supplies and Equipment, Adelaide - South Australia. We ship to your door Australia Wide. Abbaye is an ale yeast of Belgian origin selected for its ability to produce great Belgian style beers including high gravity beers such as Dubbel, Trippel and Quads. Quick start and vigorous fermentation, which can be completed in 4 days above 17°C (63°F). Medium to high attenuation and high alcohol tolerance. Low flocculation rate; settling can be promoted by cooling and by using fining agents Complex aroma and flavors may include peppery, fruity, banana, clovy, alcoholic, sweet and fruity. Does not display undesirable odors when properly handled.